It has been 8 days since my last run. I’ve been overtraining and developed a pain in my left knee. I diagnosed the problem as runners knee. It bothered me in spin class, so I got off the new bikes and did upper body weights. I hate not breaking a sweat. I couldn’t even test out the new treadmills. 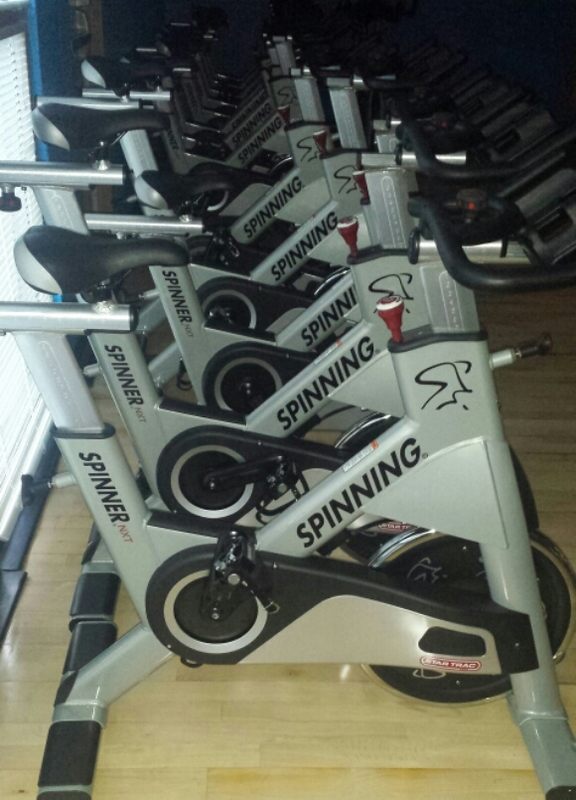 New spin bikes with improved adjustment settings. 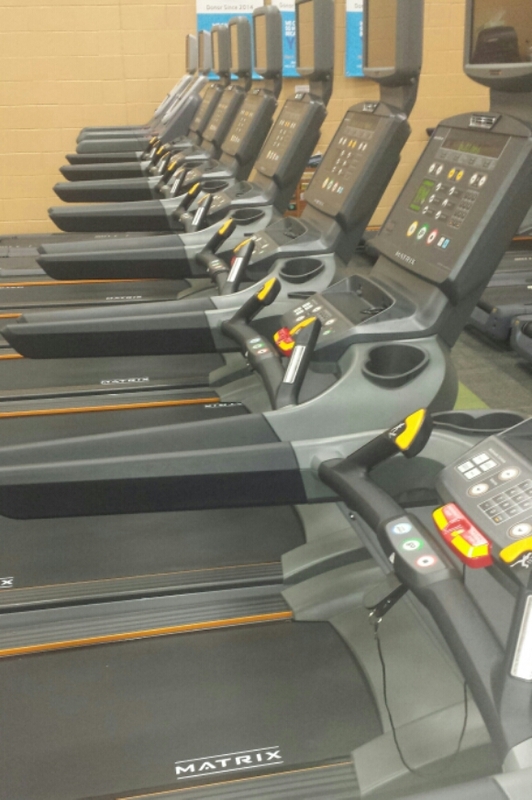 Treadmill running is better than no running! I thought taking a few days off would help me run pain free for my long run. I ran 10 miles before going to West By God last weekend. I felt like a gazelle clocking 7:26 for my first mile. I told myself to slow it down and finished at a 7:47 pace. Sadly, I woke up Sunday with the same knee pain. This time I knew I had to take the R.I.C.E. process seriously. Running long runs at a faster pace than my BQ goal is counterproductive and I am suffering for it now. I feel like I have to watch every morsel I eat because I will gain weight from not running. My sleeping needs have decreased to about 6 hours per night compared to 8-9. Here I am at the best physical shape of my life with a mindset to BQ and I’m sidelined. 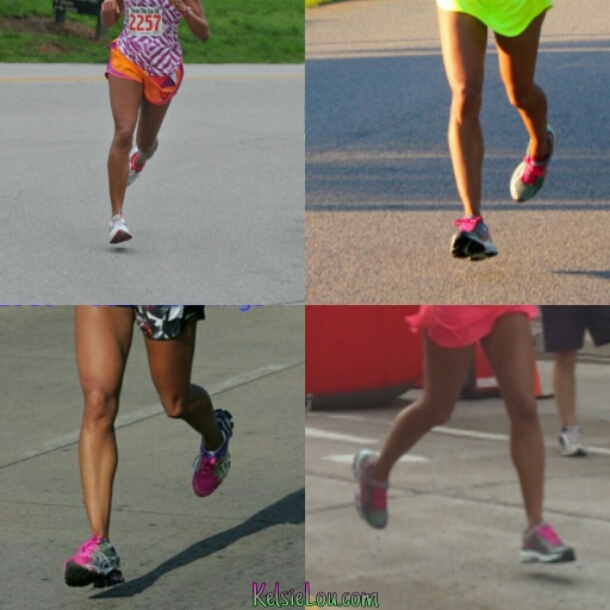 Besides over training, improper footwear can cause runners knee. Last summer, I was fitted for shoes and told that I was a neutral runner. I’ve stuck with Asics Cumulus and Nimbus and any other Asics with a cute colorway I could find in the 6pm outlet. I should have started this training cycle with a new shoe. I felt like I still had some life in the 5 or 6 Asics I rotate based on color. I was told that while a shoe may have tread, the sole layers break down resulting in decreased performance. I kept an open mind as I visited Swags Sports Shoes yesterday. I even brought my Mom along so she could be properly fitted for her walking/jogging needs. 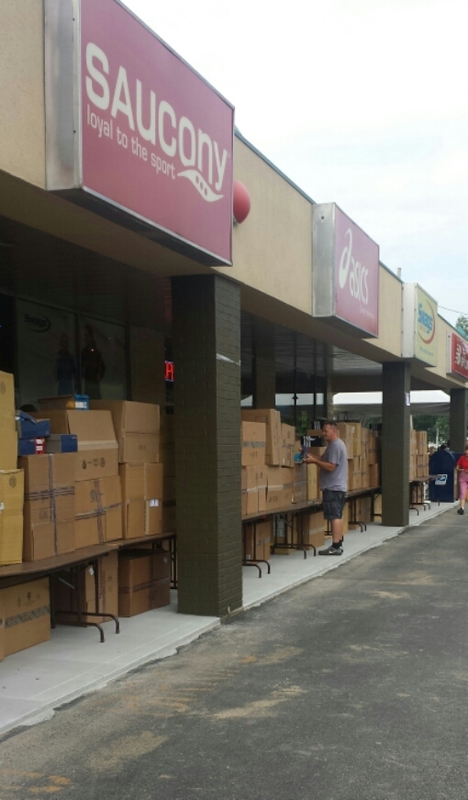 We also wanted to check out Swag’s annual clearance sale. Swag's Annual Clearance Sale. The other side of those boxes were packed with people! The store was packed shoulder to shoulder. One of the sales reps still took the time to fit us. My Mom needed a wider width in a size down from what she normally wears. She was very unhappy about the Brooks style and color. I reiterated that we were there for fit, not fashion. She settled on the Brooks as I felt like the parental roll was reversed by me telling her what was in her best interest. Next, it was my turn. I explained my training needs and the sales rep observed my flat footed gait. He said I needed stability. I told him about the neutral assessment and he couldn’t believe it. I didn’t want to be defiant, so I went with the flow. He brought out a regular width size 11 Mizuno Wave Paradox. I have never tried this brand. I walked about 5 steps and agreed to purchase before my analytical mind talked me out of it. Blue is not my color!! I tried the shoes when I got home and they seemed big in the toe box. I was wearing my favorite Feetures which are my thicker socks. I changed to a thin Asics sock and it was clear the shoes were too big. Analytical Kelsie kicked in about how ugly the shoe was. I Googled images and felt like Christmas morning when I saw pink and green. I called the Swag’s East location and they had the pink colorway in a 10.5! I tried those puppies on and they fit perfectly! The true test will come after I heal and run a couple miles. I plan to take another week off and start back with a couple miles. I don’t know how missing two long runs will affect my STL RNR marathon training. I cannot go from rest to a 14 mile long run. If I need to scratch the October 19th race, then so be it. I have a year to get a 3:40 BQ time. It will be heart breaking because I felt so good going into this training. I’ve already looked into Jacksonville on Dec 28th. Mercedes Benz with Karen is in the works for Feb 2015. Indy would be a perfect substitute with a Nov 2nd date to buy more time, but I have another commitment for that week. This entry was posted in fitness, Louisville, marathon, running, spinning and tagged Mizuno, Swag's Sport shoes, wave paradox. Bookmark the permalink. Love those wild designs on your new shoes and the colors are sooo cute! I hope your pain subsides soon, I wonder if icing your knee might help? Just a thought. Keep up the good work and get your rest. Thank you C.Rae! I hope it goes away soon too! I hope you recover fast and soon!! 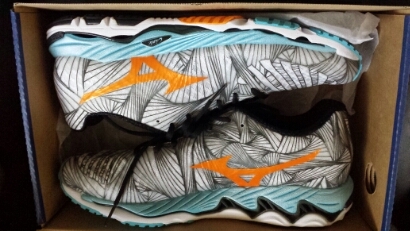 I also have been meaning to try Mizunos…I hear they are great shoes. Sending positive recovery vibes for that knee. I agree with the comments about the foam roller…that is a miracle worker as I have been really reaping the benefits! I know how frustrating this is but you really are doing the right thing by doing rest and recovery. Have a great weekend! Thank you Chelsea! This too shall pass!! I have knee pain pretty often throughout my running training… Something that I read in “The Lore of Running” and then again on a couple of different running articles is that tight hamstrings can contribute to the pull and pain in the knee tendons… It made sense, since the IT tendonitis is usually treated by massage and stretching on, above, and below the area… and plantar is massage on the location, and stretching the calves… Is it true? Who knows? But I figure taking the foam roller to my hammies would, at best, fix some of the knee pain, and at worst my hammies would no longer be super tight. I sit a lot for work, so the rear muscles and leg muscles tend to “shorten” through the day…which causes more tightness. In the end, foam roller to the hamstring and the calf pretty much alleviated the pain. I did not stop running through this either, so there’s no saying that it could have been the rest. RICE is great, and should be done, I’m just offering an idea for treatment going back into running. Don’t rule Boston out just yet! Its going to be a lot of work still, but things can always go really, really right during a race. Just do your training and take care of your “pangs”. A trainer at the Y told me to foam roll my spine to help release new cells in my body. I’m willing to try anything and will foam roll my entire body!! I’m thinking I should skip 1 more long run and gradually build miles next week with plenty of rest in between and try to pick up on my next long run mileage. Thanks for your support Eli! That does sound like a good plan. Never heard of the spine thing… That sounds like a stretch, but you know, foam rolling anything can’t hurt right?! Good luck. I am nowhere near the athlete you are, Kelsie, but I know the frustration of getting an injury and having to forgo workouts. You long for what you used to take for granted, normalcy. Be patient. It sounds like you are taking good care of yourself and will be fine. Those shoes are awesome looking. I don’t use them anymore but Mizunos were very good to me in the past – I wish you the same luck!! I noticed they don’t have any reflection. There is a coating that is supposed to make them water resistant in the toe and other parts. So glad you are listening to your body. And love the new shoes! Glad you got refitted and hopefully this will correct everything. I have been resting too…and for the record, have managed to lose weight (without changing my diet). Probably because I’m not running so I’m not getting “rungry” or having the “runchies.” Regardless, I go back to the podiatrist on Wednesday and am hoping for good news. I’ll call or text you that night. Sounds like you’re on track to a full and better recovery. You’ll only get stronger. And we both learned a lesson, I think, about pacing and doing too much while training for a marathon. Hard lesson…but at least we caught our stuff early before it got worse. I’ve noticed a decrease in appetite too so that’s a good thing. Always craving sweets though. Yes, I am glad we both are getting this out the way now. I’m not angry if I have to skip STL. I would be if I was in week 16 or something. Hang in there! Take care of that knee so you can hit the pavement stronger than ever. 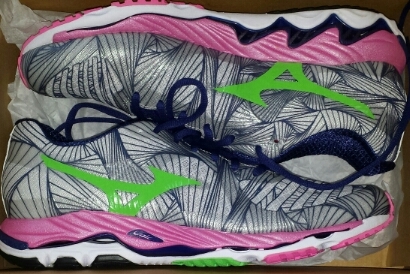 Love the Mizunos!! I will! Thanks for the motivation! I tested my new shoes you purchased for me this morning. Fit was great and my feet felt totally supported. I was able to walk with a straighter back and leg pain was eliminated. Must find shorts and tops to match the color of the shoes. Thanks again! 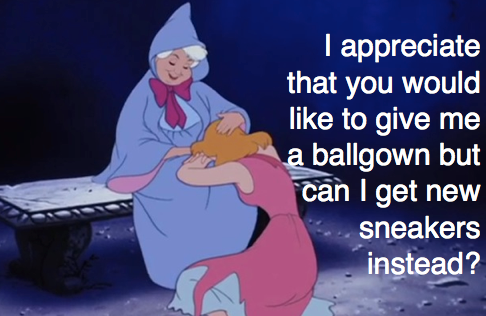 You’re more than welcome. Whitney and I are out for a walk with my new Waves. So far, so good. I’m sure you will find something at the new outlets.